Kickstart 1.2 first appeared in October 1986 and the first sign that there was something different was that the ‘Insert Workbench Disk’ screen now had V1.2 added to it, making it much easier to tell which version of Kickstart you were using. It was the first version of Kickstart to have the Autoconfig feature (the expansion.library module). 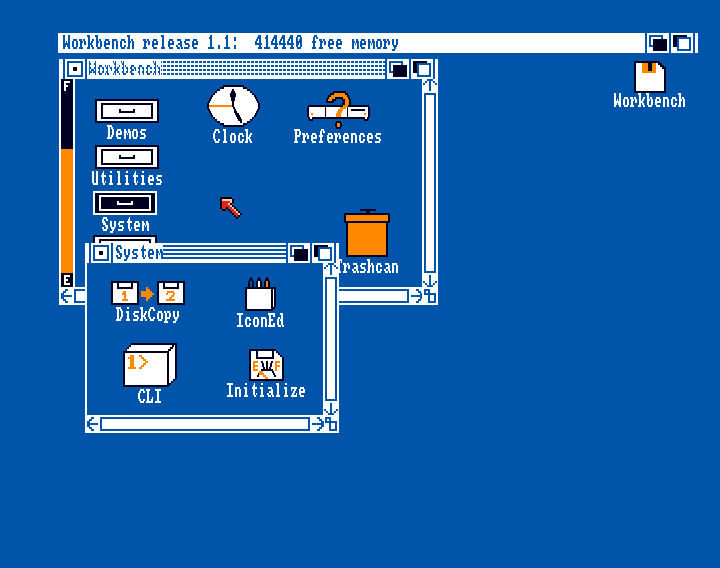 This feature allowed expansions that were added to the Amiga system to be automatically configured to use with the system, much like the “Plug and Play (PnP)” standard that was to come much later, but this worked from the start, with the exception that hard disk drives were not able to be used as a startup disk, due to a bug, which was fixed in Kickstart 1.3 and above. There was no longer a separate version for NTSC and PAL, as timer.device now detected which sort of machine it was running on, and adjusted the timers and screen modes available accordingly. In another big improvement, this was the first version of Kickstart that not only came on a floppy disk for the (newly renamed) Amiga 1000, but it was stored in ROM for the brand new Amiga 2000 model. This meant that, instead of requiring the user to insert the Kickstart Disk after turning the machine on, as was the case with the Amiga 1000, the user only had to insert the Workbench Disk, or whichever other software disk they wished to use. It was also the first version used in the Amiga 500 when it was released in 1987. The presentation of windows opened by Intuition received a small makeover, as can be seen below, making it clearer which window was active and which ones were not. 2 windows open under Kickstart 1.1. The System drawer is the active window. 2 windows open under Kickstart 1.2. The Workbench1.2 window is the active window. However, it was not without problems. Not only was there the bug that prevented systems from starting from a hard disk drive, but due to frustrations with Commodore within the Amiga team, an Easter Egg was hidden in Kickstart 1.2 that was, well, not complimentary to Commodore. Commodore management found out about it and stopped rollout of machines with the new Kickstart while they removed the offending message and changed it. Unfortunately, this meant that the new Amiga 500 was unavailable to most of those who wanted it for Christmas 1987. Below we have listings for the modules contained in the 2 different Kickstart 1.2 versions, the Amiga 1000 Kickstart Disk and the Amiga 2000 and Amiga 500 Kickstart 1.2 ROMs.